Subtalar arthritis is characterized by pain in the hindfoot that is aggravated by standing and walking, particularly on uneven ground. It is likely to be associated with stiffness when attempting to move the foot from side to side. The location of the pain is commonly just below the level of the inside and outside ankle bones (medial and lateral malleoli). The most common cause of subtalar arthritis is a previous injury – usually a calcaneal fracture, or abnormal alignment of the heal bone. 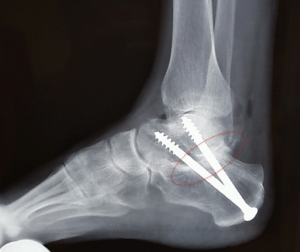 Non-operative treatment involves: 1) limiting the movement and loading through the subtalar joint by wearing comfort shoes, bracing the hindfoot and weight control; 2) activity modification such as decreasing standing and walking, particularly on uneven terrain; and 3) masking the pain by taking NSAIDs, if tolerated, to improve pain control. Surgery is indicated for subtalar arthritis that has failed non-operative treatment. Fusion of the subtalar joint is the most predictable surgical option, as it trades painful motion for relief of pain and improved function. Operative treatment is usually reserved for extensive subtalar arthritis that has failed non-operative management. 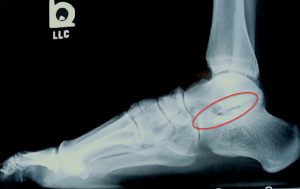 Occasionally patients will be noted to have an isolated area of damage to the subtalar joint, or will have a loose body which can addressed by cleaning out (debriding) the subtalar joint, either arthroscopically or more commonly by opening the joint. However in most instances, patients with subtalar arthritis have lost significant cartilage and need to have the subtalar joint fused (Figure 2).